The dominance of advertising in everyday life carries potent cultural meaning. As a major force in the rise of "image based culture," advertising spreads images that shape how people live their lives. While scholarship on visual images has advanced our understanding of the role of advertising in society, for example in revealing how images of extremely thin female models and athletic heroes shape ideals and aspirations, images circulated through lagnuage codes--or "verbal images"--in advertising have received less attention. Imaging in Advertising explores how the verbal and visual work together to build a discourse of advertising that speaks to audiences and has the power to move them to particular thoughts and actions. In this book, Fern L. Johnson presents a series of case studies exploring important advertising images--racial connotations in cigarette advertising, representations of cultural diversity in teen television commercials, metaphors of the face appearing in ads for skin care products, language borrowed from technology to sell non-technology products, and the illusion of personal choice that is promoted in many Internet web sites. 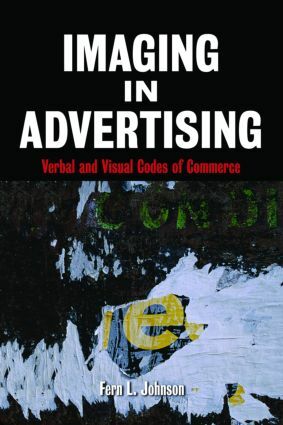 Johnson argues that examining the interplay of verbal and visual images as a structured whole exposes the invase role of advertising in shaping culture in 21st century America.